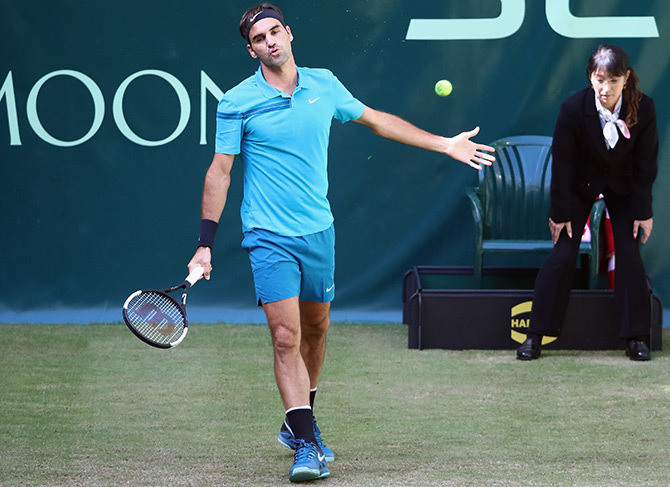 World No 1 Roger Federer was tested once again in Halle but did enough to overpower Australian Matthew Ebden 7-6(2), 7-5 in the quarter-finals on Friday. Nine-time Halle champion Federer, who saved two match points to beat Benoit Paire in the second round, edged a tense opening set against 60th ranked Ebden in the tiebreak with a backhand winner. Ebden was leading 5-3 in the second set against the 36-year-old before the Swiss fought back to secure four consecutive games to set-up a semi-final against American Denis Kudla. Federer extended his grasscourt streak to 19, which includes the Stuttgart title and last year's triumphs at Wimbledon and Halle. Qualifer Kudla, ranked 109th in the world, eased past Japan's Yuichi Sugita 6-2, 7-5 earlier in the day. Kudla progressed to only his second semi-final at ATP tour-level when he roared back from a 2-5 deficit in the second set and saved a set point in the process. Australian maverick Nick Kyrgios blazed past Feliciano Lopez with a barrage of aces to reach the semi-finals of the ATP 500 Fever-Tree championships at Queen's Club on Friday. The 23-year-old was in dazzling form as he claimed a 7-6(5), 7-6(3) victory against the defending champion to set up a clash with top seed Marin Cilic who breezed past Sam Querrey. Former world number one Novak Djokovic also looked in ominously good shape as he beat France's Adrian Mannarino 7-5, 6-1 to book his place in the semi-final where he will face either Jeremy Chardy or Frances Tiafoe. Kyrgios has his detractors, and his volatile temperament has frequently landed him in hot water with the game's authorities. But on his day, when his mind does not wander and he lets his racket do the talking, there are few players who can electrify a tennis court quite like him. He finished off Lopez with his 32nd ace on Friday, matching the total he landed against Briton's Kyle Edmund on Thursday, having also served 18 against Andy Murray on Tuesday. So far his favourite weapon has delivered 4,100 pounds this week to a London children's hospital, which benefits to the sum of 50 pounds for every ace fired down on the Queen's centre court. With two more matches still possible, few would bet against Kyrgios adding his name alongside a prestigious list of winners here, that donation looks set to swell. "I can't remember a specific time when I've served at this level back to back," Kyrgios, who was narrowly beaten by Roger Federer in Stuttgart last week, told reporters. To bracket Kyrgios purely as a serving machine, however, would be inaccurate. On Friday against the cultured left-hander Lopez he illustrated just how many weapons he has at his disposal -- including the logic-defying trick shots. His jabby double-handed backhand, delivered with almost no backswing, gave him the first mini-break in the first set tiebreaker, and he followed that with a backhand passing shot off a low skidding Lopez approach. An exquisite lob gave him daylight in the tiebreaker and then he ended the first set by feathering a crafty drop shot. Playing classical serve and volley tennis, Lopez exerted pressure on Kyrgios in the second set but there was no hint of the meltdowns that have occurred in the past. At 3-4 Kyrgios was down 15-40 but conjured a 134mph second serve on his way to holding. The world number 21 then faced a set point at 4-5 but Lopez was powerless as another ace flew by. Kyrgios got steamed up early in the tiebreak, yelling at his entourage. But he remained calm enough to claim victory with yet another bamboozling first serve. The day's earlier match was a snooze fest by comparison as Cilic beat Querrey 7-6(3) 6-2 in little more than an hour. Cilic failed to convert a set point in the 10th game but once he had taken the opening tiebreaker he was untroubled. The big Croat, winner of the prestigious Wimbledon warmup event in 2012 and runner-up in 2013 and last year, was ruthless as he won nine points in a row on his way to a 4-0 lead and was untouchable on serve as he sealed victory in 78 minutes. 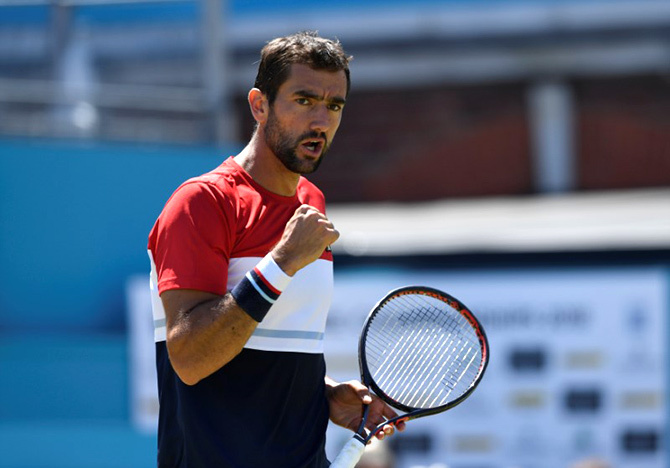 Croatian top seed Marin Cilic marched past Sam Querrey into the semi-finals of the ATP 500 Fever-Tree championships at Queen's Club on Friday, winning 7-6(3), 6-2 in little more than an hour. The battle of the big-servers went to an inevitable tiebreak in a first set in which break point chances were few and far between, although Cilic did fail to convert a set point when American Querrey served at 4-5. Cilic, winner of the prestigious Wimbledon warmup event in 2012 and runner-up in 2013 and last year, ran through the tiebreak and surged clear thereafter. He won nine points on his way to a 4-0 lead and was untouchable on serve as he sealed victory in 78 minutes. Cilic will face either Nick Kyrgios or Spanish defending champion Feliciano Lopez in Saturday's semi-final. A resurgent Novak Djokovic, looking for his first Queen's Club title, plays Frenchman Adrian Mannarino later. Andy Murray will play at next week's Eastbourne grasscourt championships in a bid to prove his fitness for Wimbledon. The Briton returned to action at Queen's Club this week after almost a year away with a hip injury but lost in the first round of the Fever-Tree championships to Nick Kyrgios. "I'm looking forward to getting some more time on the grass courts at Eastbourne this week," the three-times Grand SLam champion, who had surgery in January, said in a statement. "I played Davis Cup there in 2006​ and I know the courts and facilities there are excellent. It was good to get back to competition at Queen's this week, and I'm hoping to building on that next week at DevonshirePark." After defeat by Kyrgios, former world number one Murray cast doubt on his fitness for Wimbledon, saying he was unsure whether he would have been able to play a best-of-five-set match. He did impress, however, pushing the Australian to three sets and he will look to further test his movement and gain some match sharpness at the ATP 250 event on the south coast. Twice Wimbledon champion Murray joins fellow three-times Grand Slam champion Stan Wawrinka of Switzerland in accepting a wildcard at the event, which is the last tournament before Wimbledon starts on July 2.